This crack is so thin it requires more face moves than finger jams. The starting moves are on thin finger jams and very thin edges for the feet. 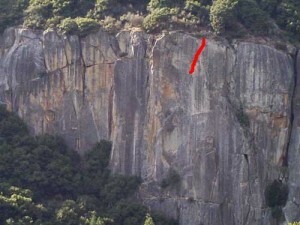 Steep and technical edging moves lead to the right crack with secure hand jams. Which SuperTopo guidebooks include a topo for Butterfingers?